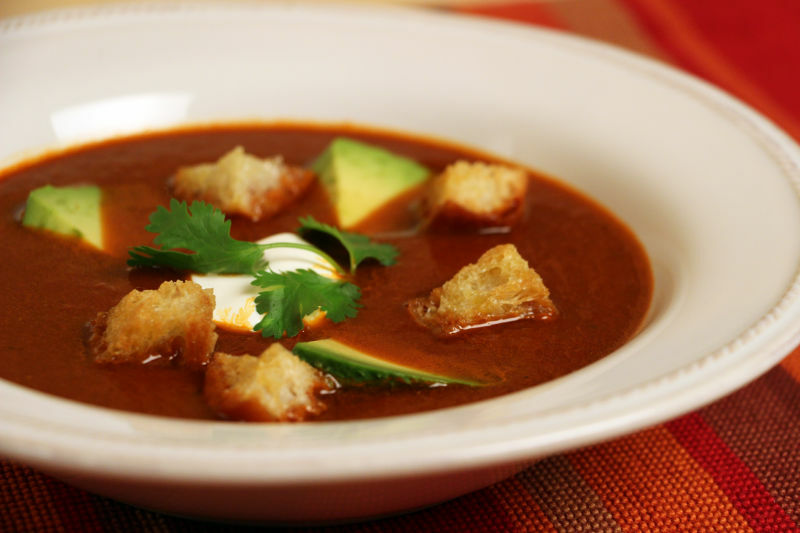 "This garlic soup is similar to one I enjoyed in a restaurant in the town of Playa del Carmen, where we owned a vacation apartment for several years. The soup can be made with ancho or guajillo peppers, but I chose pasilla peppers, which are long black dried chilies with crinkled skin. (These are called chilaca peppers when fresh.) They have a complex taste and smell of chocolate, tobacco, and earth. Lots of garlic, onions, tomato, olive oil, and a bit of flavorful Mexican oregano complete the ingredient list. Soak the chilies in 8 cups water for a couple of hours, until softened. Remove the chilies from the water, reserving the soaking liquid. Remove and discard the stems and seeds and coarsely chop the chilies. (You should have a good cup.) Strain the soaking liquid and set it aside. Sauté the onions and garlic in the olive oil in a large saucepan for 3 to 4 minutes, until blond in color. Add the chopped chili peppers and cook for about 1 minute, then add the tomatoes, reserved soaking liquid, oregano, and salt to taste. Bring to a boil, reduce the heat, partially cover, and boil gently for 30 minutes.